As I spend every spare moment preparing for a garage sale, I thought I'd re-run my post about my love/hate relationship with garage sales so you know I'm still alive... just living in garage sale prep H-E- double-hockey-sticks. 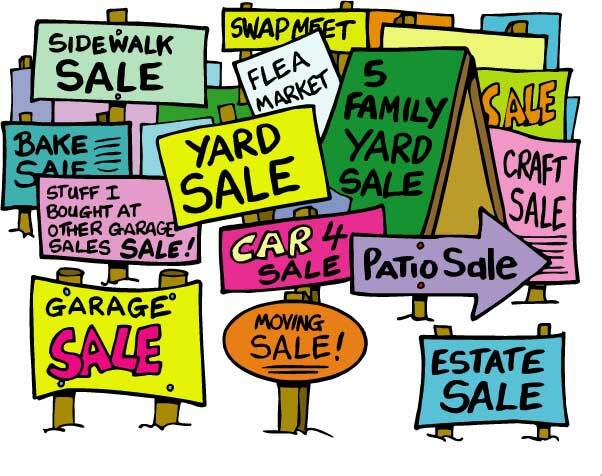 Soon I will share lots of tips about how to prepare and have a successful garage sale, stay tuned! I have a love/hate relationship with garage sales? Yes, I did. Ok, then. If I have a love/hate relationship with garage sales, why would I want you to do it. Well, the love outweighs the hate... let me show you why. They are SO much work. They require tons of time to go through all of your junk stuff, especially if you're trying to do a major purge like me. They take up lots of time. You sacrifice your weekend to the sale. Plus, all the preparation, purging, pricing, etc. Lots of late nights pricing/organizing while the kiddos are in bed. Customers who want something for nothing. Don't offer me a quarter when I'm asking $2 for something that originally cost $30. $1 yes, quarter NO. My husband, aka. the purging maniac, tries to get me to sell things that aren't for sale, like our children. Just kidding! More like the crock pot, it takes up lots of space and we don't use it everyday but Hello... I totally use it all the time in the winter! They force me to get rid of junk stuff I don't use. I am purging from the whole house! I pulled so many clothes out of my closet that it filled up my garage sale "holding area" office! The toys that are unmanageable will be purged to a manageable size (I hope?!). I am blessed with a generous family who likes to spoil my boys. We have a TON of toys. So many that they don't even notice when something is missing. I rotate the toys every 4 or 6 months so that they have "new" things to play with. Even so, we have an abundance that are outgrown or just not played with enough and they are going to the sale. $$$MONEY MONEY MONEY$$$!! My junk stuff earns me money! This outweighs all of the negatives in the list above. If you are on a budget having a successful garage sale can give you some extra guilt free cash. Maybe take a little weekend getaway and not have to feel guilty about pulling money out of savings. Maybe you desperately need a new dishwasher, maybe you are saving up for a trip to Disney, maybe you are trying to get out of debt. Whatever it is, garage sale money can give your fund a boost without taking from your day-to-day budget. In my experience the extra money is completely worth all the hassle if you have a successful sale. How do you feel about having a garage sale? Ever had one? Thinking about it? Share your tips! I am thinking about having my first one ever! However, I don't know that I really have enough stuff to have one. We actually are saving for a new couch and the extra yard sale money would be GREAT! I thought about putting my bows and tutus in it.... but like you mentioned- they want something for nothing... so I'm not sure bows are really yard sale material? What do you think? Great read and great suggestions weighing out the pros and cons. I needed to read this as I've often contemplated whether I should have one or not. Thanks for the treat tips! i dont price anything! Saves time. Make up as I go! HATE them! But I will have to agree, I love purging all the things I don't need, and a few extra bucks in my pocket make it worth it. I can't say I've got any tips to offer since I've only done two of them, but I am looking forward to what everyone else has to say! I hate having them but I LOVE shopping at them. If I do have one, I find I do better bringing my stuff to a church yard sale adn renting a spot. They do all the advertising. Hey Kate, we must be on the same wave-length.....I just posted how to have a good yard sale on Friday! (think I linked it to your party?) Pretty much a love-hate too! But I've found I love making everything FREE! I'm done in the time it takes to unload the car and the stuff never comes back!! Try it! I love this post!! I've had several garage sales. We lived on a busy road, to the point that I would have an ad in for Sat-Sun, but have a "soft opening" on Friday so I could get set up without pressure. All I did was put up a sign on the road. The real plus to a garage/yard sale is that when you open, all the hard work is done. You negotiate, collect money and meet tons of great people! That was the best part! I sold a pair of $250 snakeskin almost new boots (I bought them too tight!! )to the sweetest girl for $5 if she promised to wear them, dance in them and have lots of fun! We still made money and had a great time!! Yes, there is so much preparation, but sooo worth it!! !